This is an ad for Tide that I found in a fashion magazine. The first thing that I noticed about this ad was the model. This was the only ad in the entire magazine with a solitary model of color. There were a couple of ads with groups of models where one or two wasn’t white, but not a single other ad just had a woman of color by herself. And the ad that did was all about protecting the color of your laundry. Wow. I wonder if she was chosen deliberately for this one? Other than what that says about print ads in general (that there is way too many white models in them, given the population demographics), this also brought out something else. Who is this all being marketed to? Do the companies that make the ads for hair dyes and make-ups and fashion lines really not care if black or Asian or latina woman buy their products? Or do they just fear that if they feature models like that in their ads, they’ll not attract white customers? And why is it ok to use a woman of color when representing bright colors or strong flavors, but not when representing just regular stuff. Don’t Asian women have to clean floors too? And don’t latinas wear perfume when they go out? And I could swear I’ve met black women who drive cars! So, yes, I have a problem with Tide using the “black person = bright colors” shorthand in their ad, but really only because that’s the only ad where a black woman was featured. If I saw black women in other types of ads and white women in these types as well (showing us the clothes are bright, so we don’t have to use the racial shorthand to illustrate it), I wouldn’t be so annoyed about it. This entry was posted on January 10, 2010 at 12:00 pm	and is filed under Home. 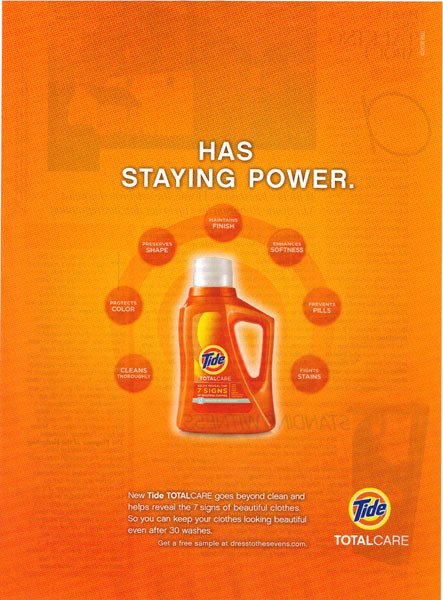 Tagged: cleaning, print-ad, race, tide. You can follow any responses to this entry through the RSS 2.0 feed. You can leave a response, or trackback from your own site.